There is no need to keep on walking down the corridor or going downstairs to answer the door, with our audio door entry 1 way kits you can remain in the exact same location whilst efficiently engaging with your visitors outside. Having the correct intercom systems in place can save you the hassle of travelling further than you need to as well as giving you time to prepare for arrivals that bit better. 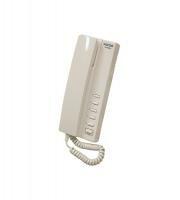 You also gain great safety benefits implementing phone door security. Direct Trade Supplies enables you to pick from some of the most reputable and reliable door entry kits around. 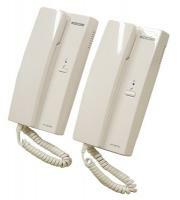 Manufacturer’s such as Videx make up the majority of our intercom systems available. Door access systems produced by Videx range from the simple 1 way kits to more elaborate and multifunctional audio door entry kits offering up to 7 way audio door entry kits catering for larger premises. The pros of installing an one way audio door entry system depends on a few things, points to consider are the size of your property, its number of workers or inhabitants as well as your budget. If you share responsibilities of keeping a large number of staff or tenants inside the building, or there are various rooms in the building then buying a 4 or up to 7 door entry service kit can have a positive impact. 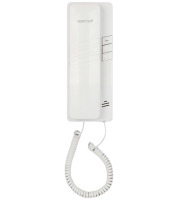 Alternatively if the building has a smaller set up you may only require a simpler one way door entry system. 1 way audio door entry kits including our Videx Floush Mount systems need little maintenance and guarantee a safe and smooth door release facility. Just from one designated area you can quickly action the doors release or speak to the receiver before deciding upon or preparing their entry. 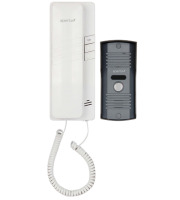 These audio door entry kits are known to be one of the most hassle free door access controls available, not only is do they boast convenience but every product has been quality assessed for safety capabilities and functioning. With just a simple hello and confirmation you can efficiently hit the lock release button and await your visitors’ entrance. Many of the audio kits are designed with a professional and stylish finish, this helps to present your business or building as a respectable and modern fixture. 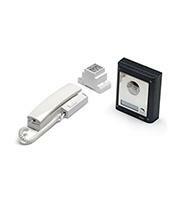 By applying a 1 way phone door entry kit you will instantly reap the rewards of using a smooth and integrated function. You will wonder why you put up with walking down those stairs or lengthy hallway for such a long time. With Direct Trade Supplies you will only be receiving top of the range audio entry kits, made by prestigious manufacturers for your security and convenience needs.